Christmas has come and gone and in the UK it has been very cold with a lot of snow. This makes the loft not a pleasant place to be. The unusual cold has created some problems mainly with traction tyres and lubrication. Traction tyres on quite a number of the Diesel fleet have cracked and then fallen off. This bits have had to be searched out so they don’t get sucked up into the motors of the other locos, and then the traction tyres have to be replaced. All the fleet that have been used this winter needed to be cleaned and serviced before they were used. I think a lot of the reluctance to run on some of them was the lubricants being too cold. They have all been now done with Peco electro lube. 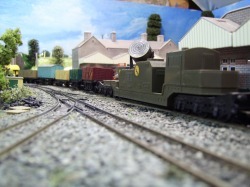 Work on other steam locos this quarter includes the fitting of new smoke deflectors to City of Nottingham. 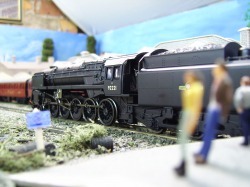 When this loco arrived earlier in the year the smoke deflectors were missing. 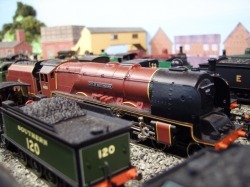 Trying to source Hornby replacements has not worked, so these are brass kits. They have not be put together exactly as the kit because City of Nottingham was missing some fittings, so these have put on as best as they could be. 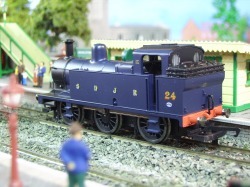 I am quite pleased with the results and think they have improved the looks of this loco. I have also repainted some more of the old badly painted triang stock I had got and this is now back in service. 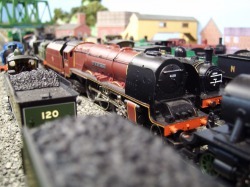 Two new locos arrived this quarter, a second British Railways 9F Number 92221 and the Somerset & Dorset Joint Railway, Jinty Number 24. 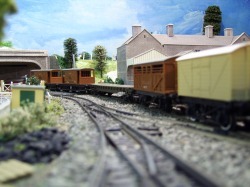 Other new stock is a range of old wagons including an ex-army searchlight. I have added just small bits and pieces to the area around Peaks Summit just to make it look a bit more finished. This is quickly becoming my favourite station on the line.